The ecotypes of killers live in many places around the globe, with Hebridean population decreasing (our story from the "West Coast Community" is at: Orca's Hebridean Overture, while Norwegian, Icelandic and several Pacific communities prosper rather better. This enthusiast is in the Antarctic enjoying the provision of ample food supplies in the form of Weddell seals in the Weddell Sea! Public appreciation of orcas as the killer whales should now include a remarkable similarity to the life-styles of humans themselves. Grandmother orcas are one of only 3 species (the other one is the short finned pilot whale, Globicephala macrorhynchus) that become menopausal. This restriction on reproduction is associated with increasing fecundity of daughters in a species. The female orca for example is less successful at breeding than her daughters when they reach reproductive age at around 15 years old. Selection ensures that a role for older females must be found if they are to survive and Lauren J.N. Brent and her 5 colleagues have gathered an extensive dataset to investigate this. The paper also determines whether grandmother orcas lead groups around their traditional Chinook salmon (Oncorhynchus tshawytscha) fishing grounds. They publish their open access paper in Current Biology from the Universities of Exeter and York, UK, and the Center for Whale Research in Friday Harbor, Washington, US under the title Ecological Knowledge, Leadership, and the Evolution of Menopause in Killer Whales . Rather like humans, female killer whales, breed between the ages of 12-40 and live into their 90s. Males rarely survive beyond their 50s! The maternal group is the most significant for the whales, with sons even more likely to follow their mothers than daughters. When the salmon don't turn up, the orcas can die off, especially without leadership. After analysing 751 hours of video off the BC and Washington coasts, studying activity during the annual summer salmon migrations of 2001-2009, the leadership of groups was established. 102 individual orcas were also observed in records dating from 1976 to determine relationships. Older females (over 35 years-old) were more likely than adult males to lead especially when the salmon numbers were low. We have known for some time that adults benefit from their mothers' presence, with mortality increasing significantly after the mother's death. Sons have higher reproductive potential than daughters, with much greater fitness benefits, but daughters live longer, giving greater potential over time. Undoubtedly, though, sons rely on mothers while all whales follow post-reproductive females at times of low salmon abundance. 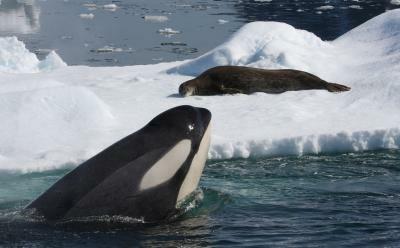 Ecological knowledge within the old females plays a large part in orca survival. When the fish don't run, natural selection plays for the grandmothers who know where they have found food in years gone by. The authors claim that preliterate humans would also use the old for information in situations such as drought. We can't deny that social interaction also plays a part in both orcas and humans. Recent work on the functions of older elephant (Loxodonta Africana females could shed more light on how experience plays a part in the assessment of and solution to problems. Real interest now lies in how other orca ecotypes use their social structure and whether menopause occurs and then lays a part. Do they help particular relatives, especially their sons and thereby evolve the menopause?